We have issued a response to the BMA survey on GP pressure. See the blog post for our complete statement. General practice is at the heart of the improvement we want to see in the NHS. 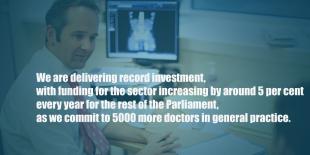 We recognise absolutely that it is under pressure, which is why we are delivering record investment, with funding for the sector increasing by around 5 per cent every year for the rest of the Parliament, as we commit to 5000 more doctors in general practice. The Health Secretary will shortly announce further support for GPs, which should assist in meeting the pressures doctors are reporting. With NHS England, we have said that we will increase funding for primary medical care by 4-5% every year to 2020/21. We saw an increase in the number of doctors who took up GP training places last year. This was partly thanks to a successful GP recruitment campaign, led by HEE in partnership with the RCGP. We are also offering more support for those who wish to return to the profession and developing specialist training opportunities to help attract doctors from other specialties into the profession. Future plans include a renewed drive to cut bureaucracy throughout general practice, including stopping re-referrals from hospitals back to GPs, streamlining payment systems so that practices don't have to chase different organisations for payment, and helping surgeries become paperless. The Care Quality Commission will also be looking at what more they can do to streamline their inspections.